These five stocks should be on your sell list for 2014. BALTIMORE (Stockpickr) -- With yesterday's modest retreat in stock prices, 2014 officially starts things off as the worst year for stocks since 2008. Not so fast, though -- the sky isn't falling just yet. After all, the S&P 500's paltry 1.09% decline year-to-date isn't exactly threatening the multi-year rally that we've ridden this far. Instead, that stat speaks more to the strength that the post-2008 rally has enjoyed. When a 1.09% drop is a notable move, you know you're looking at a pretty good time to own stocks. But that doesn't mean that it's a good time to own all stocks. The laggard names in the market right now could be downright toxic to your portfolio. And the time to unload them is now. That's why we're taking a closer look at five toxic stocks you should be selling in 2014. To be fair, the companies I'm talking about today aren't exactly "junk." By that, I mean they're not next up in line at bankruptcy court. But that's frankly irrelevant; from a technical analysis standpoint, they're some of the worst positioned names out there right now. For that reason, fundamental investors need to decide how long they're willing to take the pain if they want to hold onto these firms this summer. And for investors looking to buy one of these positions, it makes sense to wait for more favorable technical conditions (and a lower share price) before piling in. It's been a good year to own shares of Regeneron Pharmaceuticals REGN; in the last 12 months, the biopharma stock has rallied around 50%. But after a big move higher this past year, shares of REGN are starting to roll over. And it doesn't take an expert technical analyst to see why. 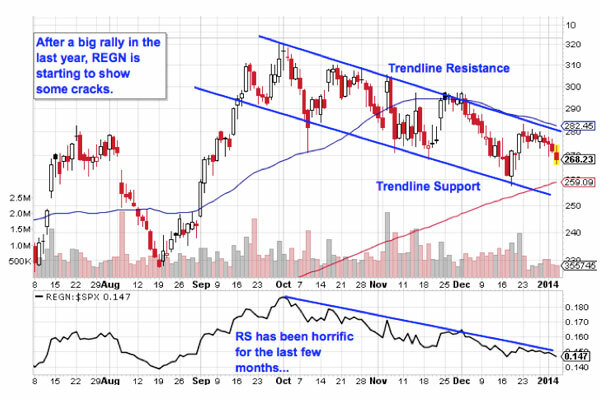 That's because shares of Regeneron are currently forming a downtrending channel, a price setup that's formed by a pair of parallel trendlines bounding REGN's share price movement. When it comes to price channels, it's about as simple as it gets: Up is good, and down is bad. So now, as Regeneron bounces off of trendline resistance, shares look ready for another leg lower. The underperformance in REGN is compounded by horrible relative strength at the bottom of the chart. That relative strength line is a particularly important indicator to keep an eye on now, and more underperformance in REGN looks even more likely as a result. We're seeing the exact same price setup in shares of mid-cap natural gas company Questar (STR, even if the chart looks a little different at first glance. Like REGN, Questar is currently forming a downtrending channel, but in this case, the channel is bounded to the downside by two extra support levels. Don't expect support to provide a reprieve from selling, though the trend is clearly down from here. 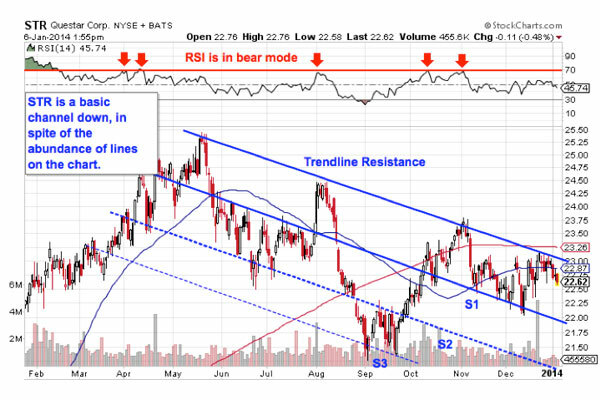 STR is sitting up near trendline resistance right now, which provides an optimal time to exit a position in shares. This stock has gotten swatted down on each of the last three attempts to push through the top of the channel, and with shares slipping for a fourth time, the message is pretty clear that the trendline isn't going to break this time around either. Momentum (at the top of the chart) has also been held down below the 70 level over the course of this setup. Expect a momentum move above 70 to lead a change in trend in STR; it's just not happening anytime soon. Small-cap insurance name Enstar Group (ESGR - Get Report) has been missing out on the S&P's rally since all the way back in the summer -- and with price action coming to a head this month, ESGR could be in store for a big drop to start 2014. Here's why. 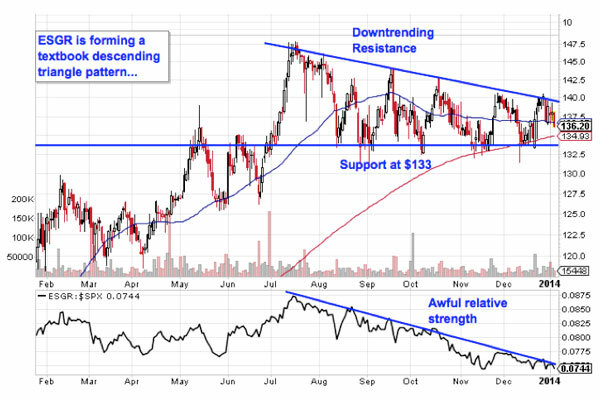 Enstar is currently forming a descending triangle pattern, a bearish price setup that's formed by a horizontal resistance level below shares and downtrending support pressing to the upside. Basically, as shares of ESGR bounce in between those two technical price levels, they're getting squeezed closer and closer to a breakdown below support at $133. A move through that $133 price level is the signal to sell (or short) this name. Relative strength is showing no signs of improvement in ESGR right now, which means that even after shedding almost 10% from its highs, this stock is still failing to keep up with the S&P's performance. Keep a close eye on this name while shares remain within reach of $133. Last year brought out some strong performance in the financial sector, but the tides could be turning in 2014 for Canadian banking giant Toronto-Dominion Bank (TD - Get Report). This $84 billion name is starting to look toppy right now. 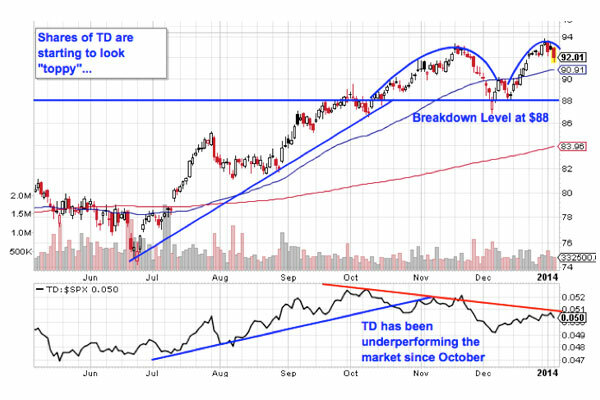 The pattern to watch in TD is a "double top." Like the name suggests, the setup is formed by two swing highs that lose steam at approximately the same level. The sell signal comes on a move through support at $88. Whenever you're looking at any technical price pattern, it's critical to think in terms of those buyers and sellers. 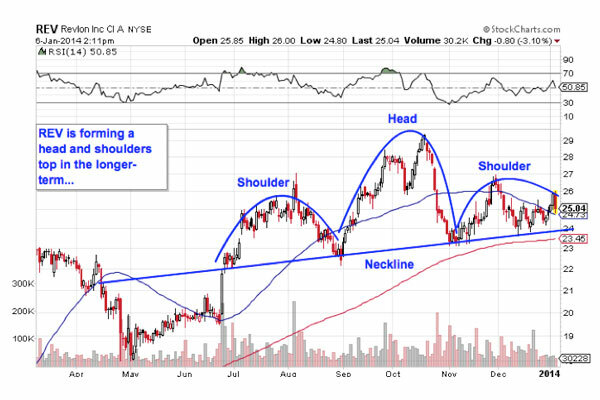 Double tops, triangles and other pattern names are a good quick way to explain what's going on in a stock, but they're not the reason it's tradable. Instead, it all comes down to supply and demand for shares. That support level at $88 is a price where there has been an excess of demand of shares; in other words, it's a place where buyers are more eager to step in and buy shares at a lower price than sellers were to sell. That's what makes a breakdown below $88 so significant -- the move would indicate that sellers are finally strong enough to absorb all of the excess demand at that price level. Wait for that indication before you sell. Last up is Revlon (REV - Get Report), the small-cap cosmetics company. Revlon is a standout on our list of "toxic" names because it's actually still trending higher right now. But that uptrend is being overshadowed by a classic topping pattern that's been forming in shares in the long-term. REV is currently forming a head and shoulders top, a bearish reversal setup that indicates exhaustion among buyers. The setup is formed by two swing highs that top out around the same level (the shoulders), separated by a bigger peak called the head; the sell signal comes on the breakdown below the pattern's "neckline" level, which is right at $24 at the moment for REV. If this stock can't catch a bid at $24, it's time to be a seller. Lest you think that the head and shoulders is too well known to be worth trading, the research suggests otherwise: a recent academic study conducted by the Federal Reserve Board of New York found that the results of 10,000 computer-simulated head-and-shoulders trades resulted in "profits [that] would have been both statistically and economically significant." That's good reason to keep an eye on Revlon in the market sessions ahead.